We have quite a baker at the 189. Hana. Vietnamese. Management post-grad. The cutest thing. And excellent with flour, eggs and sugar. I’ve lost count of the number of times I’ve trudged home after a long day at the University, only to find a chocolate cake waiting on the kitchen counter. Or a plate of blueberry muffins on the top shelf of the refrigerator. And I’ve shamelessly gobbled up most of them. They’re always delicious and somehow the perfect fix for my bouts of ‘munchies’. And it doesn’t end there. She brings on Pho just when you need it, sushi just when you’re craving it and of course, she just happens to be my Salmon Queen. Another reason I love her so much….she gushes about my cooking and photography enough to put me on the ninth heaven. The weekend slipping by right now has been an extremely sweet one. 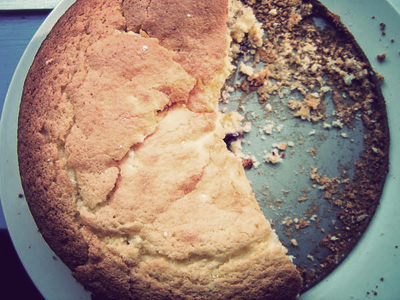 One birthday including a wholesome cheesecake and Hana’s spoon-licking lemon cake. Not to mention store-bought tiramisu (yes, store-bought). And now, I’ll be starving myself for the next week. Preheat the oven to 350°F. Grease two 9-inch cake pans. Sift together the flours, baking powder and salt. Combine sour cream with lemon zest and juice. Beat the butter on medium-high speed until fluffy (about a minute) with an electric-whisk. Gradually add sugar and continue beating until light and fluffy, scraping down the sides of the bowl as needed. Add eggs, one at a time, beating for 1 minute after each addition. Add the flour mixture and sour cream and beat on low-speed until just combined. Do not overmix. Divide batter between prepared pans until the top are golden and a fork run through the center, comes out clean. This takes about 30-40 minutes. 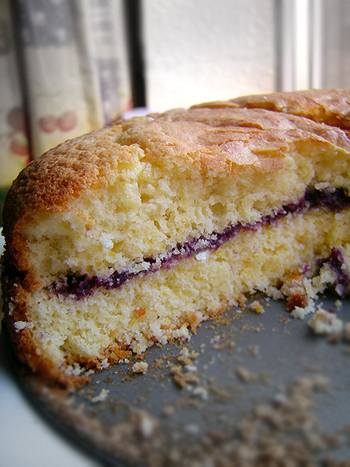 Level the top of one cake and spread blueberry jam evenly all over. Place the other cake on top of it. And enjoy with tea or coffee! What a great idea to add a blueberry spread! I bet it tasted wonderful!